Where you get arrested matters. Because municipalities determine cost of bail, bail for the same crime can dramatically change depending on where you are in a county. The reason judges set bail is to hold defendants accountable to return to court for their trial and to protect the public from risk. Not being able to afford bail can threaten an individual’s financial security by disrupting their ability to work and care for their family. Often, this system means wealthier people who are arrested can go free while low-income people may have to stay in jail. 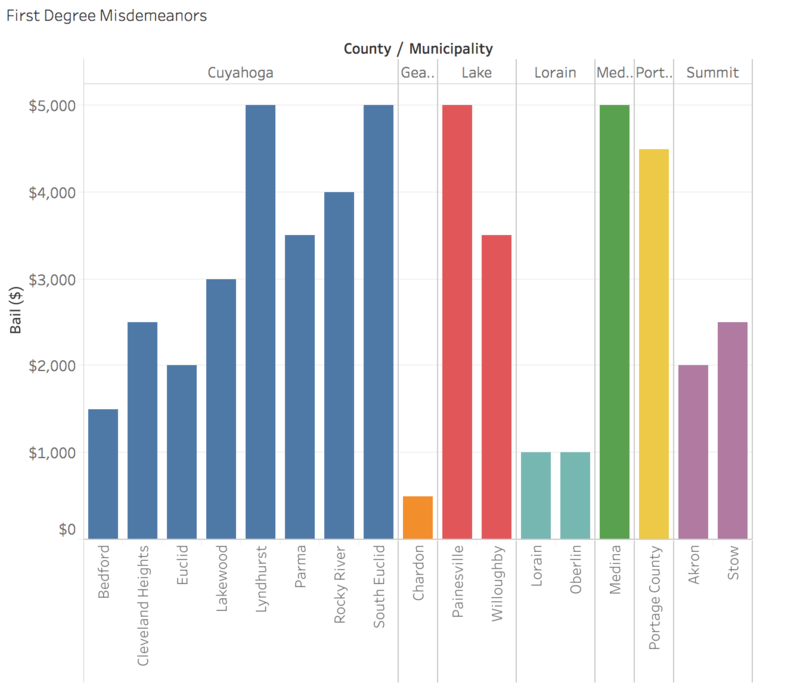 The lion’s share of courts in Ohio determine bail for misdemeanor offenses through bail schedules. A bail schedule is a list that sets bail according to a crime’s level of severity. Having predetermined amounts of bail makes it easy to set bail for low level crimes when courts are not in session. Municipal judges set schedules at their own discretion, meaning that there is no consistent standard for doing so across counties. If a defendant is unable to afford bail, they have the option of paying a non-refundable bail bond at 10% of the allotted amount. These fees go through bail bondsmen. Bondsmen must be licensed by the state and operate under the purview of an insurance company. The bail bondsman keeps this fee and posts bail in full. If the defendant does not attend court, bondsmen will sometimes hire bounty hunters to track them down. 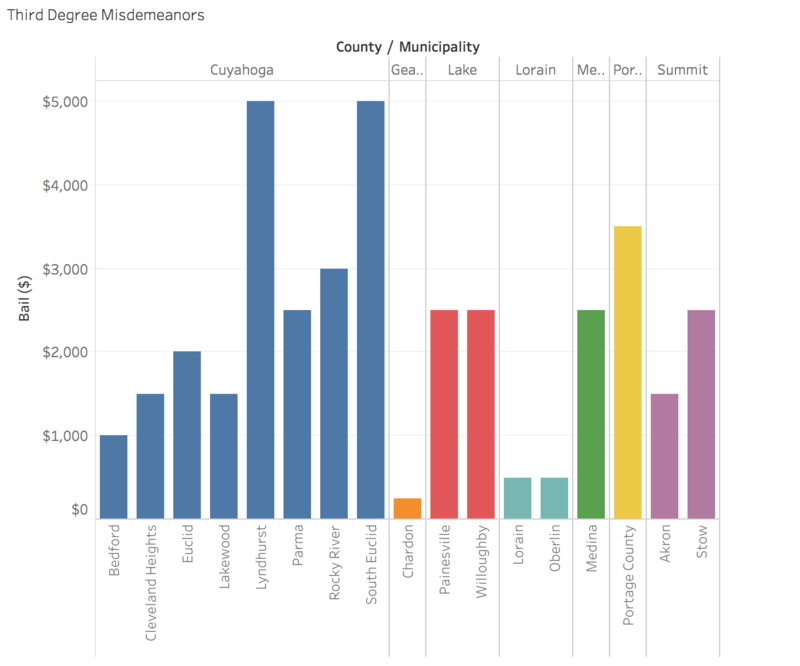 Less extreme than felonies, persons convicted of misdemeanor crimes serve under a year in a local county jail. 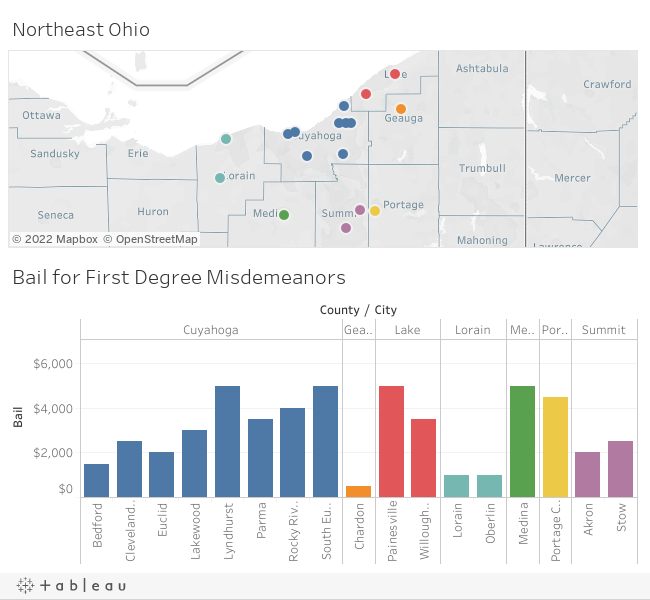 Ohio Revised Code classifies misdemeanors into four degrees, the first degree being the most serious of misdemeanors. 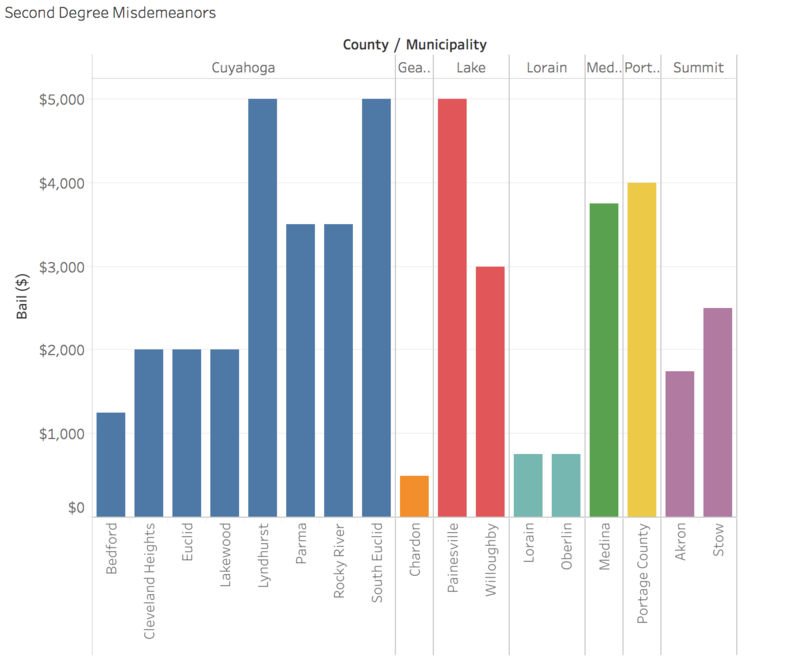 The graphs below show the differences in bail for degrees of misdemeanor offenses by Ohio residents in municipalities across Cuyahoga, Summit, Geauga, Portage, Lorain, Medina, and Lake counties. Fourth degree misdemeanors include student hazing and using another person’s property without their consent. The maximum jail time for a fourth degree misdemeanor is thirty days. 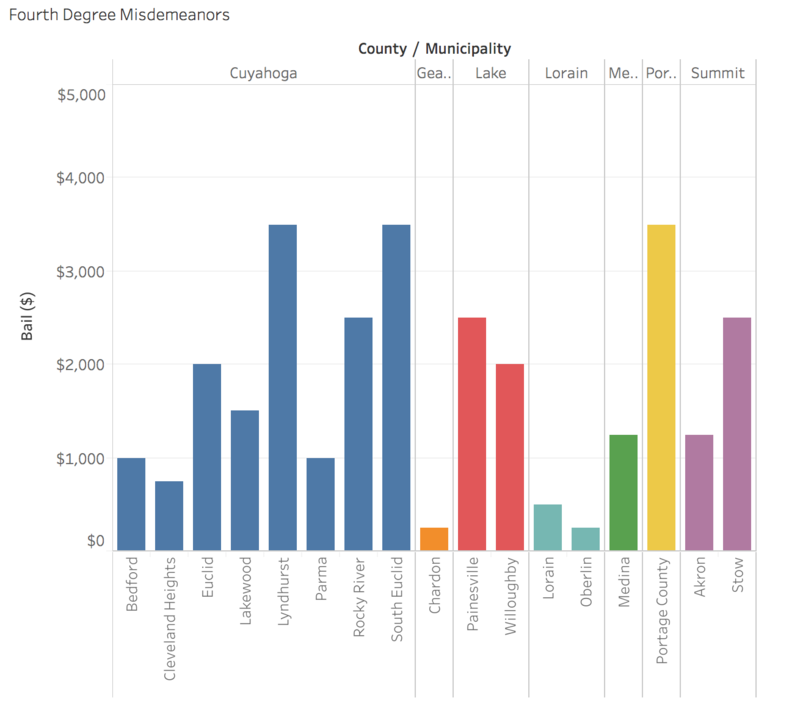 The highest bail required for a fourth degree misdemeanor is $3,500 in Portage county, South Euclid, and Lyndhurst. Oberlin and Chardon have the lowest bail required at $250. Crimes classified as third degree misdemeanors include selling small amounts of marijuana on school property and negligent assault. Jail time for these offenses does not exceed sixty days. Second degree misdemeanors include crimes as serious as possession of drug paraphernalia. The maximum jail time is 90 days. The most serious of crimes in this survey, first degree misdemeanors, includes petty theft, writing a bad check, and operating a vehicle under the influence. The maximum jail time is 180 days. Because of inconsistencies like the bail schedules shown here, advocates and legislators have come up with methods that alleviate bail’s disproportionate impact on poor defendants. According to the Ad Hoc Committee’s report, pre-trial assessment tools that set bail based on an individual’s likelihood to attend court are more effective than basing bail solely on the nature of a crime. The bare minimum, the committee asks, is that bail be set consistently between courts and counties. Of the Municipalities here, five had their bond schedules or procedures posted online; Cleveland Heights, East Cleveland, South Euclid, Stow, and Cleveland Municipal Court. East Cleveland’s schedule lists bail according to specific crimes committed. The Cleveland Municipal Court has a judge preside over setting bail in every case. For the municipalities who do not post their schedules online, we contacted the clerks individually and asked for email or fax copies of their schedules. The Municipal courts of Brooklyn, Berea, Garfield Heights, Euclid, Elyria, and Avon Lake did not respond to our inquiry.